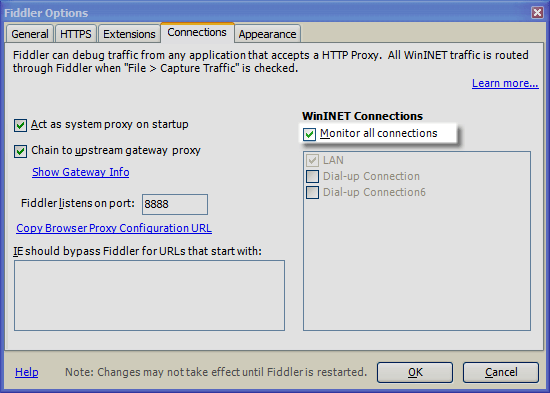 To monitor a dialup or VPN connection, open Tools -> Fiddler Options... and click Monitor all connections. Or, set the "Use automatic configuration script" option in your browser. 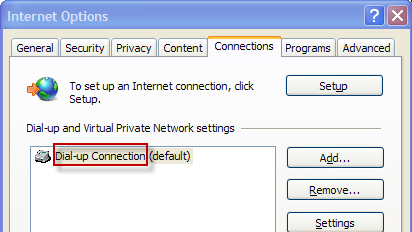 To monitor a VPN or dialup connection that is always active (instead of a LAN connection), set the HookConnectionNamed registry value to the name of the connection from Internet Options. Note: IE will always use the proxy settings from any active VPN connection, whether or not that VPN connects to the Internet.